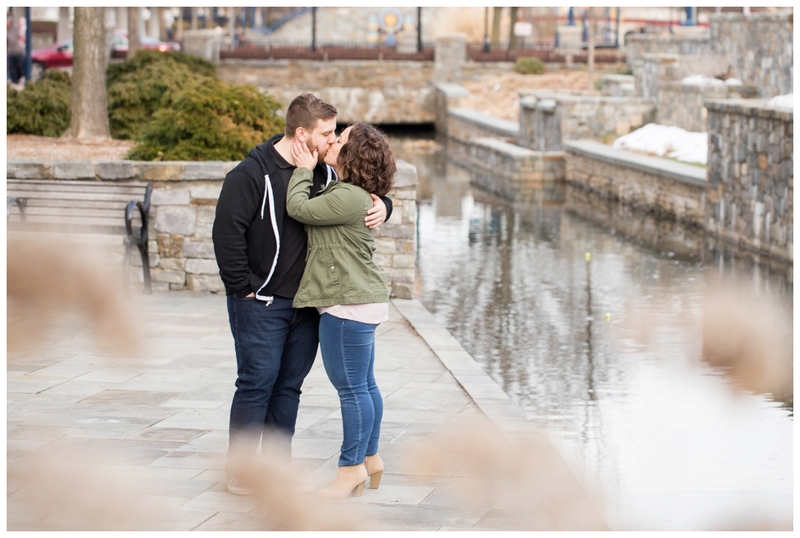 I met Alena & Tim at The Elite Wedding Expo in Frederick. They were so friendly and excited about their wedding day, and it just so happened they were the lucky winners of the door prize for my booth! As I got to know them more, I learned how well we were going to get along and how much fun they are. 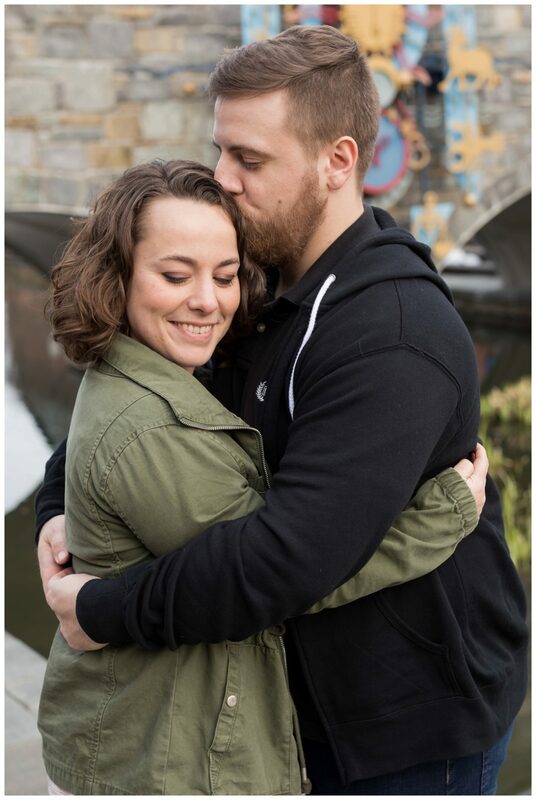 I definitely can’t wait for their wedding. 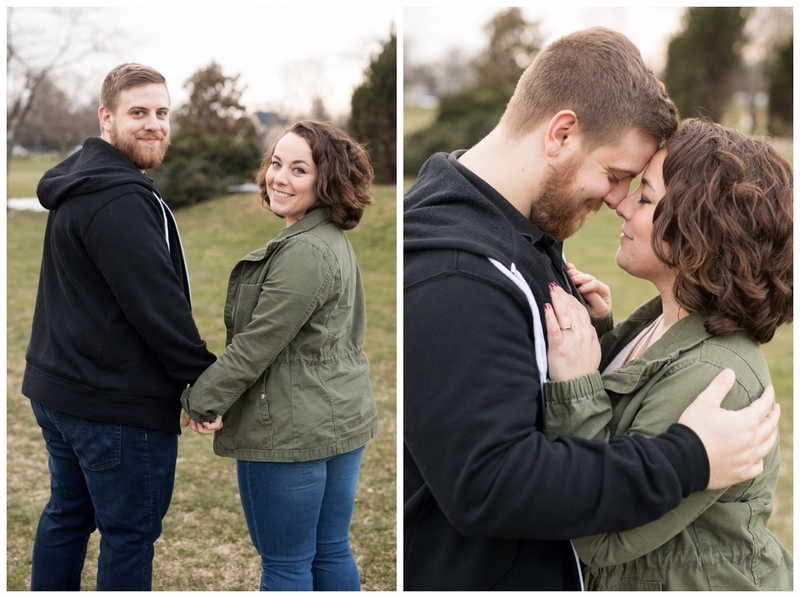 I asked them to tell me about their love story, and it definitely made me melt! Alena said that just a few months after they started dating she knew that what she felt with Tim was something she had never felt before and she loves that she can totally be herself with him. Tim agreed with never feeling this way about anyone before, while also waking up every day feeling so lucky to have her! So sweet, am I right?! 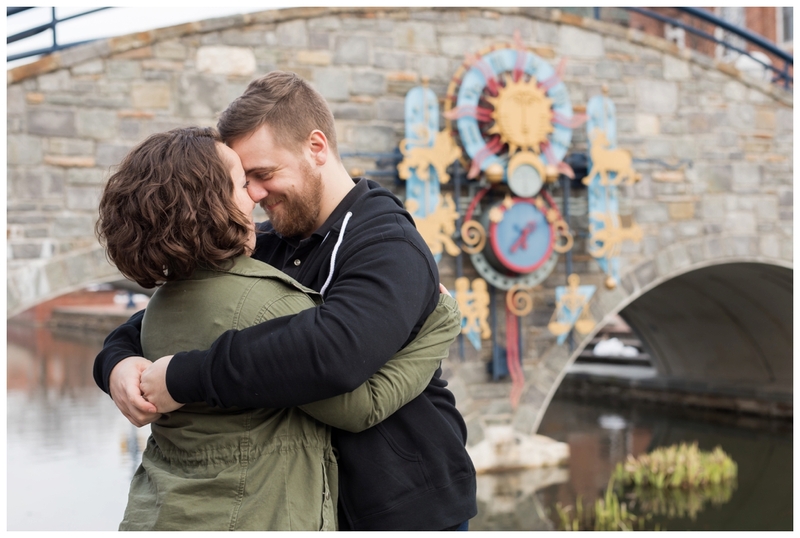 Their proposal is just as sweet! Ariel is Alena’s favorite princess, so while on a family vacation in Disney, they had to meet her(of course!). 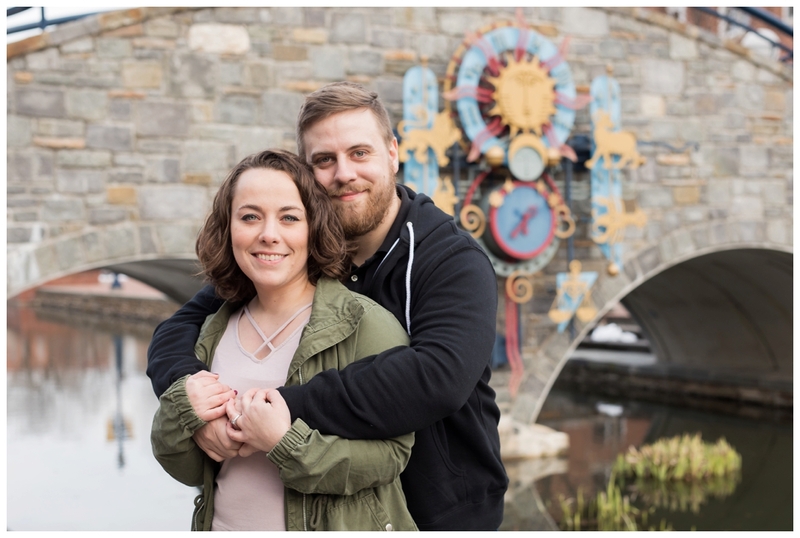 With the help of his family members and the Disney cast members, Tim pulled it off! When it was their turn in line to meet Ariel at Her Grotto, Ariel mentioned a box for them to open. Little did Alena know, her ring was inside! Tim told Alena he wanted to spend the rest of his life with her while he was down on one knee. 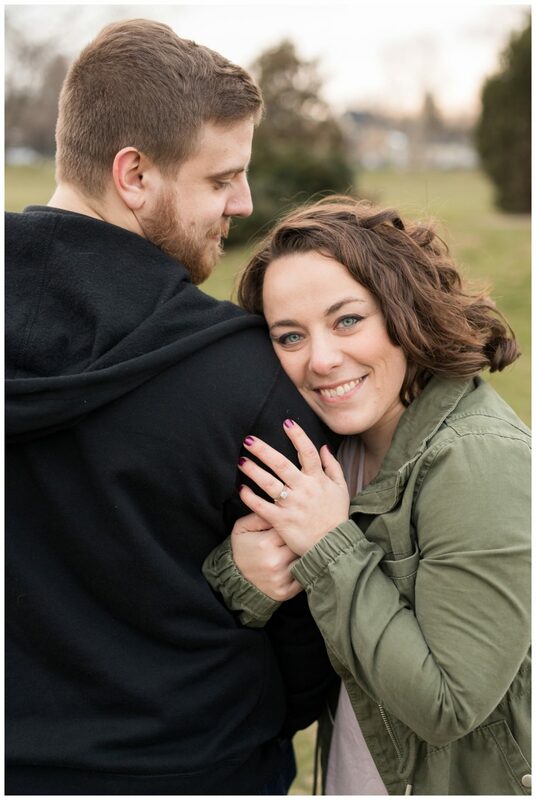 Spoiler Alert: SHE SAID YES! 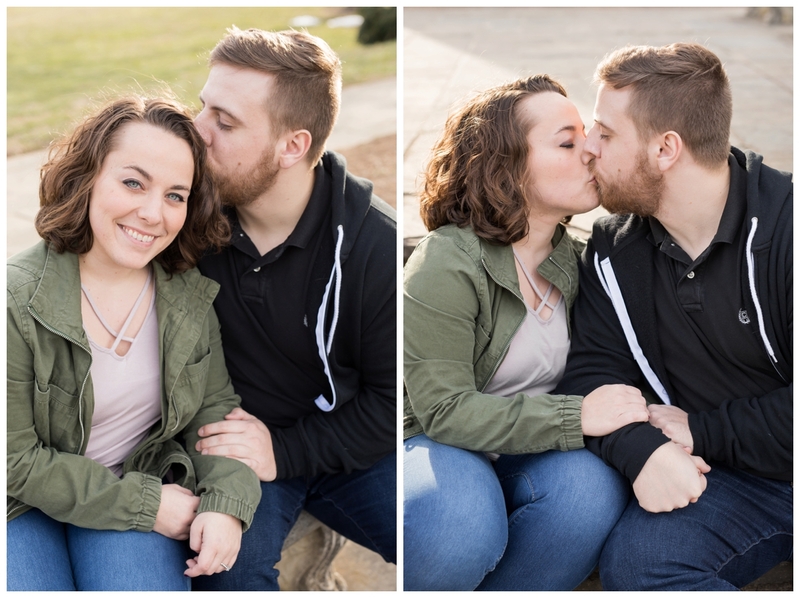 If you are a Disney lover, you will LOVE this session! 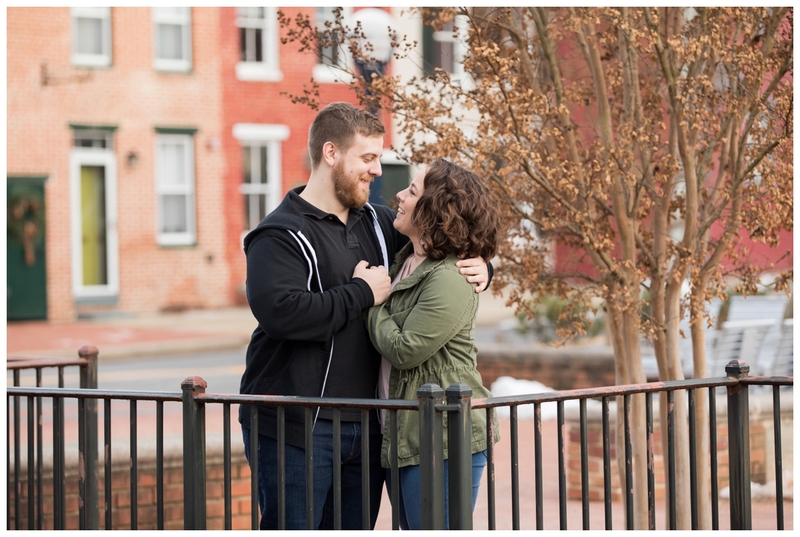 We were hoping to spend a warm spring Saturday afternoon strolling around Frederick, but mother nature decided to snow on the first day of spring and keep the weather chilly. 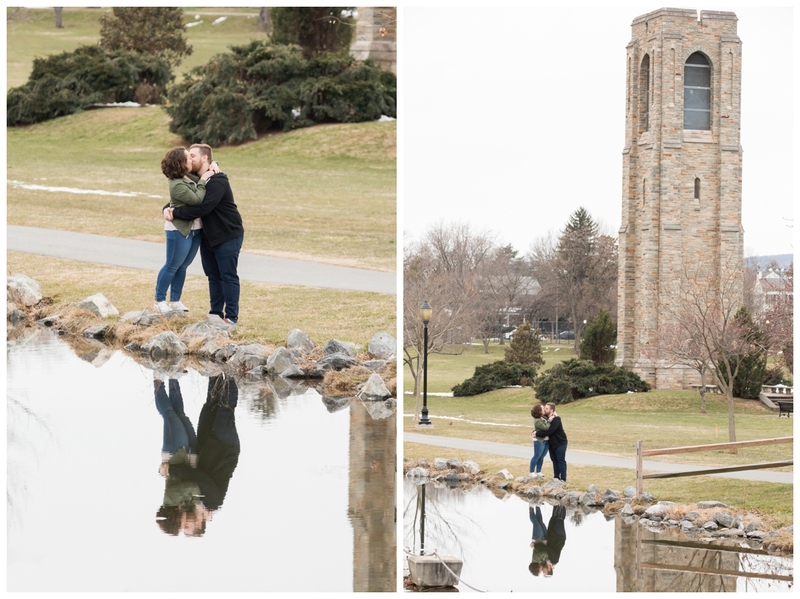 We watched the snow melt for a few days before the session, and thankfully on the day of their session the temperature wasn’t too cold. 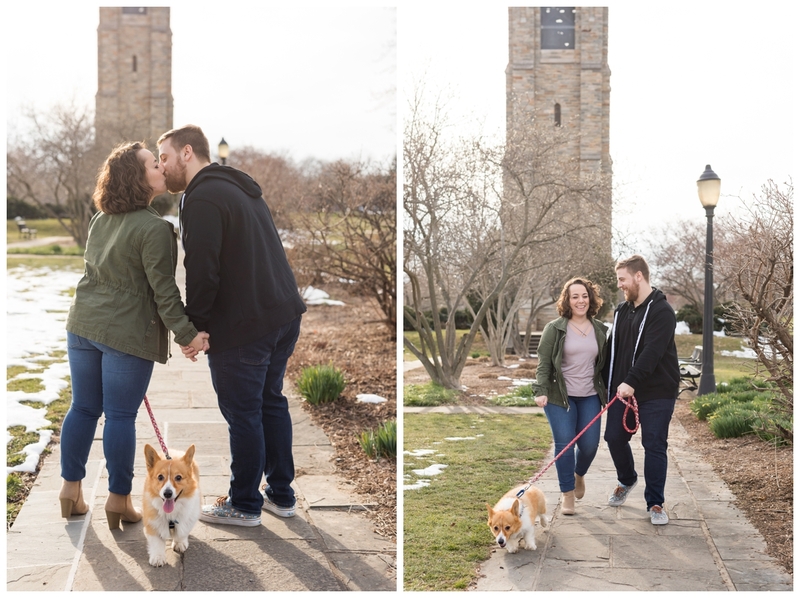 You can see winter and spring competing for the spotlight in a few of their baker park photos. 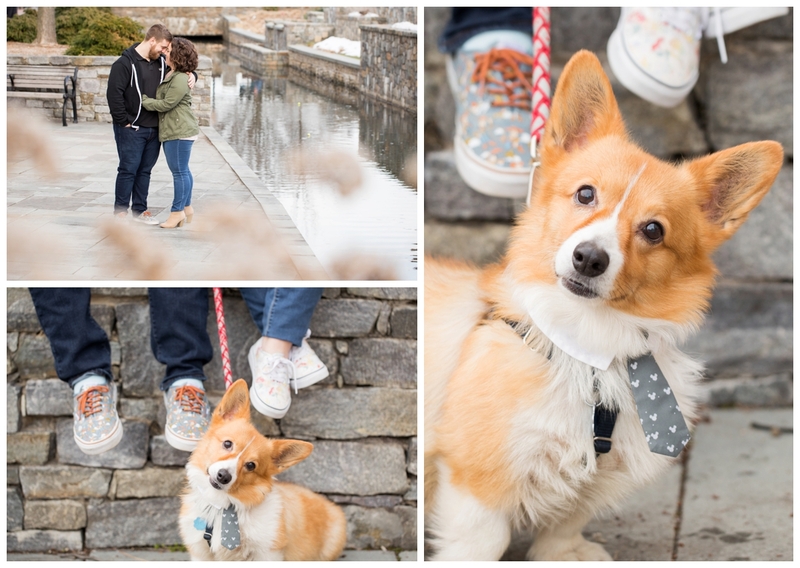 Tim and Alena brought their adorable corgi, Nemo, (do you see the Disney references yet?) who was eager to pose for the photos. 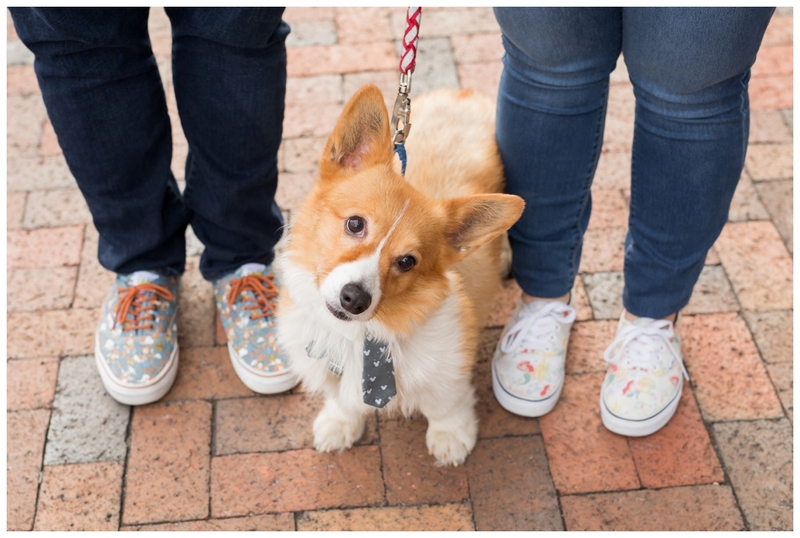 During the session Nemo sported different bow ties as well as a Mickey themed tie. Such a dapper little fur fellow. 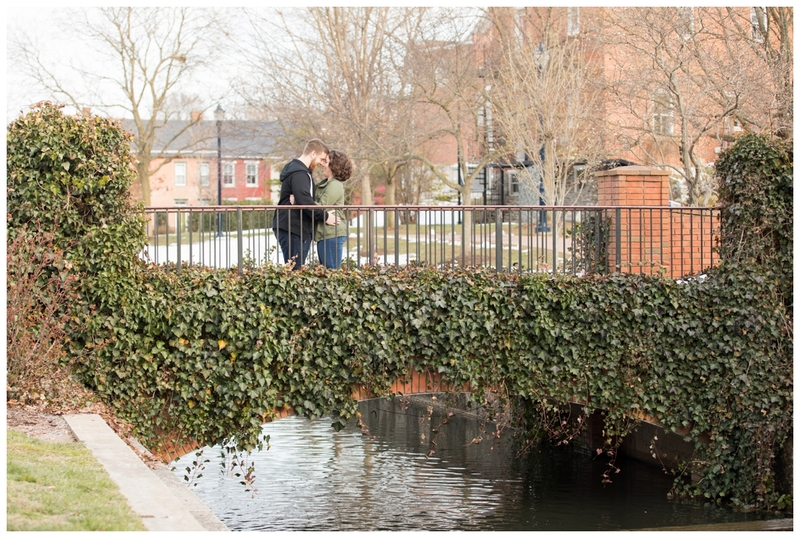 We walked along the canal from Baker Park to Downtown frederick picking up members of Tim’s family along the way. 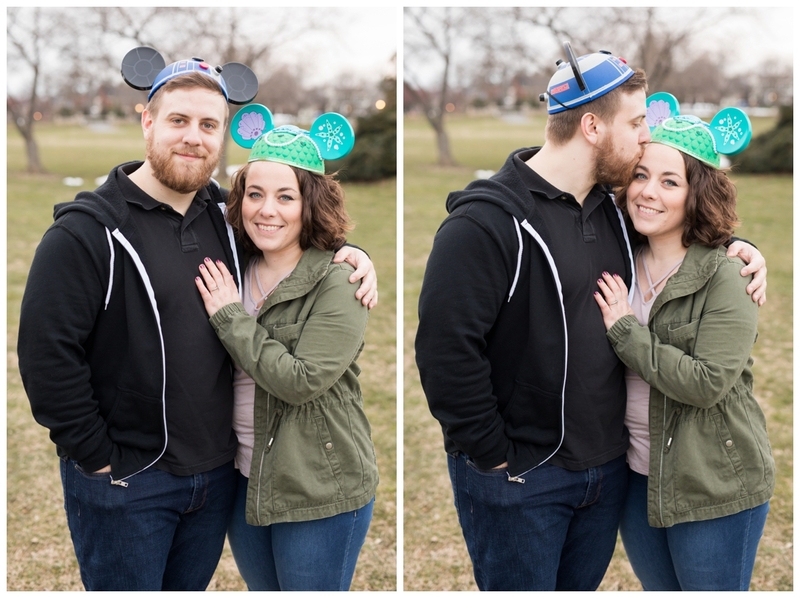 On our way back, Alena and Tim wore their Toy Story and Little Mermaid themed shoes and their Mickey ear hats (one of which Tim brought back from Disney for Alena when they first started dating). 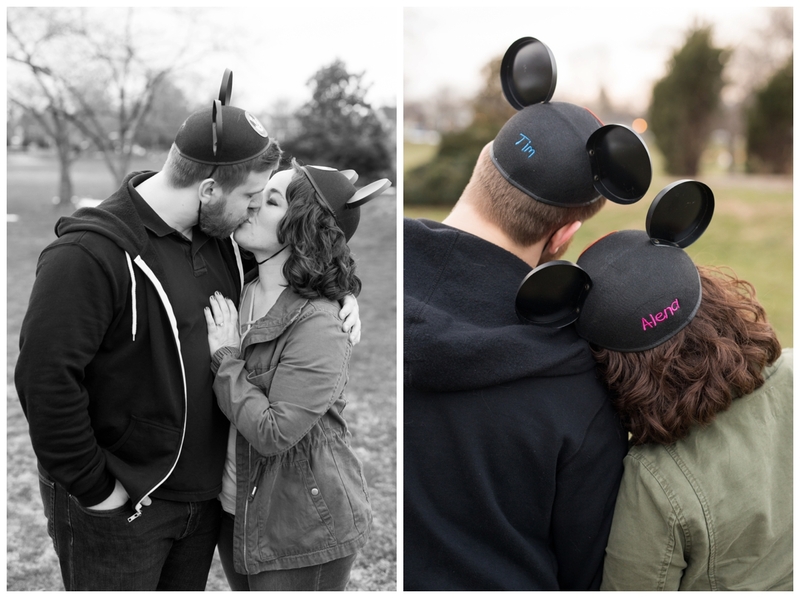 I love how their engagement session tied in their love for Disney as well as details from their proposal! Congratulations Alena & TIm!! 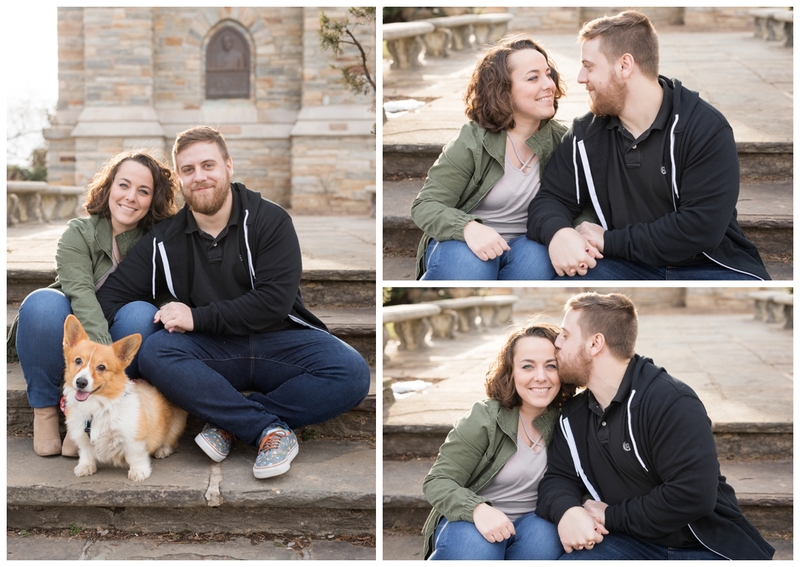 The night of their engagement session, Nemo experienced several seizures and was rushed to the emergency vet. It was determined that Nemo had a stroke which caused the cluster of seizures. Donate to Nemo’s medical fund here.